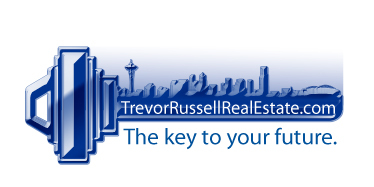 As everyone knows, Seattle’s 2015-16 Real Estate market has been characterized by extremely low inventory, buyers in droves taking advantage of low interest rates, and increasing prices… in other words, A SELLER’S MARKET! Houses are selling in days and even “tear downs” or “fixer uppers” are sometimes receiving multiple offers driving the price up. So why on Earth would a seller do a pre-inspection before putting their house on the market? If there are going to be 10 buyers putting in offers, let them pay for it right? 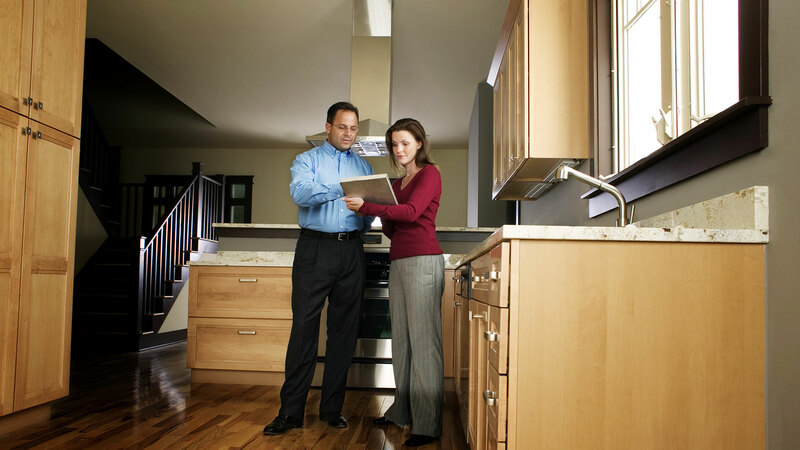 Wrong… Here are all the ways doing a pre-inspection benefits the seller. 1) See your house through the eyes of the buyer. Some sellers are afraid of discovering something wrong and then having to disclose what they find in the inspection. I’ve got news for ya, it will come up eventually… When you do the pre-inspection, you receive a full report of everything that’s wrong with your house (and everything a buyer will eventually see). We can then decide what we want to fix, and what we will leave for the buyers. It helps us prioritize. Show potential buyers that you have nothing to hide. 2) Maintain leverage. Negotiate once! In this market, the seller has all the leverage. We have a scarce product that a lot of buyers will fight for. But when you sign the contract and choose a buyer, they now have the leverage. We NEED them to close or we face having to put the house back on the market, affecting the reputation of your house negatively (future potential buyers will automatically think the buyer walked because something was wrong with the house, or they got cold feet because the price was too high). When a buyer writes an offer “subject to inspection”, they are essentially saying, we want the opportunity to walk away, or, another opportunity to negotiate on price. Marketing your house, with an inspection already completed, takes this opportunity away and keeps you in the power seat during negotiation. You negotiate only once. 3) Multiple pre-inspections are not good for your house. Inspectors, and sometimes their clients, are walking on roofs, prodding siding, running every faucet for long periods of time, turning on and off all appliances, opening electrical panels, etc. This harmful list could go on forever. Multiple sewer scope cameras cannot be good for the integrity of that sewer line. I’ve heard of some houses having a dozen or more pre-inspections within a week. That’s crazy! Show potential buyers that you care for your home and don’t want the unneeded wear and tear. 4) Multiple Inspections are expensive. It is not uncommon for 5 or more pre-inspections to be done on a well-priced listing in a desirable neighborhood… but only 1 of those buyers will “win” the house. 4 of those pre-inspections were a waste of money and time. Buyers are getting tired of spending money on pre-inspections. If a buyer sees your house but thinks they might not be able to compete with other buyers, they won’t even chance writing an offer because of the cost of the pre-inspection. Save your potential buyers the hassle and do 1 for everyone. It will motivate buyers to write an offer, knowing it won’t cost them $400+ to do so. It also shows buyers that the “other side” are honest and will be great to work with during the transaction. Every seller, by law, will fill out the Seller Disclosure Statement (Form 17) and provide to potential buyers. It is rare, but if a buyer purchases a home and finds a defect, they can sue the sellers if they suspect they knew about the defect and didn’t disclose. A seller’s pre-inspection is just one more firewall against this liability. It shows you did everything in your power to disclose everything you knew about the house. There are so many benefits for sellers, I decided a long time ago that it would be part of my service to homeowners who want to list their home with me. I will arrange and pay for the seller’s pre-inspection. We will use it to help prioritize our pre-listing maintenance and repair list. We will provide the full inspection report online (on the NWMLS listing) for all potential buyers and their brokers to see. We will also have a hard copy included with our marketing materials at the house so any potential buyers who visit during the open houses will be able to see it. Do you think buyers will be more willing to write a strong offer on your home knowing you’ve provided all the information at no cost to them? Is there value in seeing your “perfectly good water heater” is actually a 15 years old antique waiting do die any minute?… Should we spend $1000 and get a brand new tankless water heater that we can market in the listing? Maybe, maybe not, but the point is, whatever we decide, we won’t be blindsided when a buyer wants a $10,000 price reduction because of things they found in the inspection… Nice try guys, we already told you about that! I’m surprised this isn’t common practice in the Real Estate Industry. It has served me and my clients well and I hope more sellers see the advantages. I use a number of well-qualified inspectors but my favorite team is Larry and Barry Mortenson of WIN Home Inspections. They are knowledgable, experienced, professional… and they should have their own reality TV show because they are hilarious identical twins who finish each other's sentences. Last year’s Real Estate market was primarily driven by low inventory and an abundance of buyers. In 2014, home prices rose 6.1% in Seattle and 8.7% in Bellevue as Sellers took advantage of multiple offers and quick sales. The buyers who were fortunate enough to purchase, did so at a 30 year fixed mortgage rate of 3.87% per Freddie Mac. That is very close to the historic lows of 2013. With 2014 in the rear view mirror, we’d like to share with you what to expect in 2015. Inventory is still very low. In this low supply, high demand market, many houses are selling above their list price with multiple offers. With a seasonal upswing in inventory this spring, it will be advantageous for sellers who beat the competition and list early. Mortgages are still cheap, but for how long? Interest rates could be the biggest wildcard in the housing market over the next year. With many experts predicting interest rates on the rise, buying now would allow you to afford more and save you a ton of money over the life of a loan. New Federal Housing initiatives might also loosen up lending standards to help buyers. In 2015, Fannie Mae and Freddie Mac are both introducing mortgage programs that require as little as 3% down which will open up home ownership to millions. As far as Real Estate lore, everyone knows “location, location, location”. Lesser known but equally important could be “timing, timing, timing”! Whether you’re a homeowner going through a life change, or a renter ready to take on the next step in your life, we would love to sit down with you and discuss your future! It is always a blessing living on Alki, but it was particularly entertaining this past weekend. The high tide and strong wind combination created gargantuan waves that slammed the entire beach. You can visit The West Seattle Blog which has a ton of awesome photos and videos. The West Seattle Real Estate market rode a wave of its own in 2014. 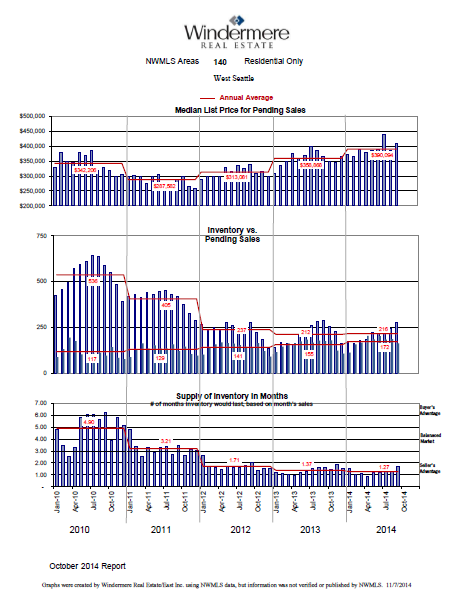 It was characterized by rising home prices, multiple offers, and low inventory. We have wonderful tools at Windermere to analyze the most current data directly from the MLS. Below is statistical information from TrendGraphix, a source available for Windermere agents. As you can see from the graph below, home prices in West Seattle have been steadily increasing since 2011, and inventory has been on the decline. Coincidence? I think not. The most important thing to remember from this information is that home prices are determined by the market. I don’t determine the price of your home and you don’t determine the price of your home. The market is simply supply vs. demand. With limited homes for sale, and high buyer demand, prices have been steadily increasing. 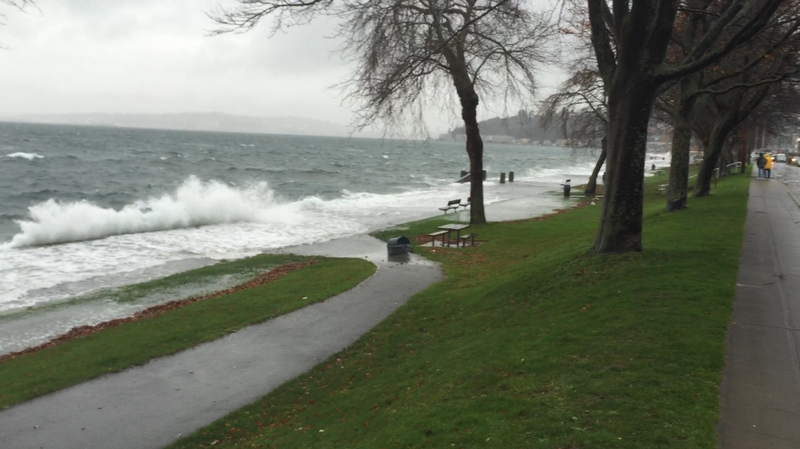 The Alki storm of 2014 was wonderfully entertaining and a bit scary, much like the 2014 year in Real Estate. I am looking forward to riding the wave into 2015.